The most versatile LC HDO Pad, remove imperfections while finishing down great! Pair with your favorite compound, or even your favorite polish! The Lake Country HDO Orange Polishing Pad is the most versatile of all the HD Orbital Pads. It can remove anywhere from light to heavy imperfections, while leaving behind a great finish. The HDO line of pads are perfectly balanced, cushioned, and feature thinner foam. This thinner foam reduces foam movement which will reduce heat (10% cooler) which can cause hazing and micro-marring while polishing. These pads are beveled at a 70 degree angle and this design prevents pad "rolling", allowing the pad to stay flat on the surface. The open cell cooling chamber in the center of the pad is another great feature of this pad as it helps keep the pad running at cooler temps, increasing durability and polishing results. The backing of these pads will also withstand the large throw of the Rupes, Griot's Boss and other high powered large throw machines. This pad comes in three great sizes and the 3.5" pads are perfect for 3" backing plates, 5.5" pads fit on 5" backing plates and the 6.5" pads fit great on 6" backing plates. Pair this Orange pad with your favorite polish to remove light to medium imperfections, while leaving behind a great finish! Lake Country is my choice of pad to use when doing paint correction. You can't go wrong with the quality of the foam. The price is a bit much but you get what you pay for. 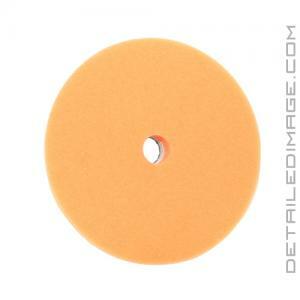 We use both the 6" and 3" polishing pads - both work amazing. They are our go to pad regardless because of how versatile they are. They clean up well and take abuse well - we've ran ours through pad washers a bunch and still crank them out on vehicles and they perform wonderfully. After using the HD line of pads from Lake Country. I will no longer be using any other FOAM pads from Lake Country, or any other brand. HD Foam Pads are Great.